Like all living things, orchids need nutrition in order to thrive. Feeding orchids is an important part of caring for them and eventually getting them to rebloom. This post will focus specifically on fertilizing Phalaenopsis (moth) orchids because Phals are the most common orchids for beginners, available everywhere from your local florist to Ikea and Trader Joe’s. The best orchid care mimics the environment of a wild orchid, so before I review the process of how to fertilize an orchid (which I promise is not hard! ), it’s important to understand how Phalaenopsis orchids grow in the wild. 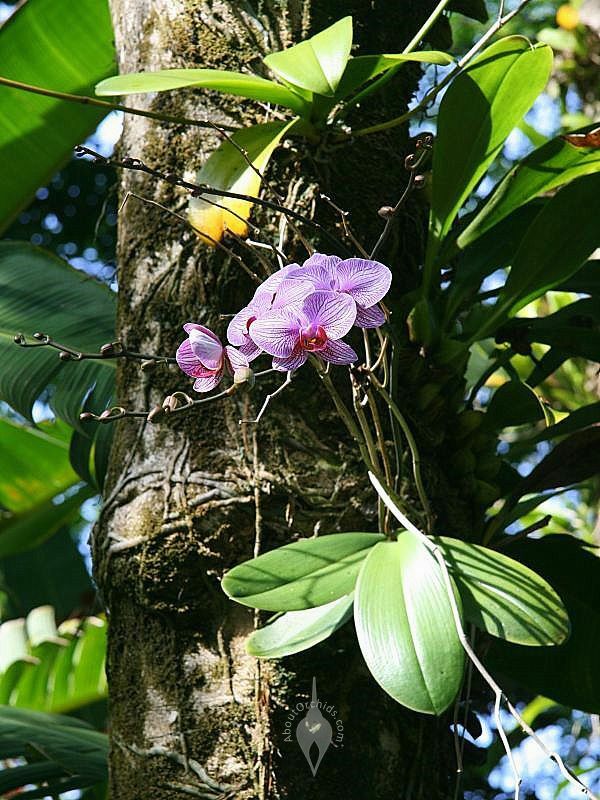 Phals are epiphytes, which essentially means they are air plants that grow attached to tree trunks, branches, and rocks (see image to the right). Their roots are mostly—often entirely—exposed to air. Orchid roots collect moisture and nutrients from the surrounding environment; organic materials such as rotten leaves, bird droppings, and minerals in rainwater serve as orchid food. When shopping for orchid fertilizer, be sure to read the N-P-K ratio listed on the label. You’ll see numbers like “30-10-10” or “20-20-20.” This ratio refers to the percentage of N-P-K in the fertilizer. How do you know what N-P-K ratio your orchid needs? The simplest guideline is to use a higher nitrogen fertilizer (30-10-10) for Phals planted in bark mix and a balanced fertilizer (20-20-20) for those planted in other types of potting medium such as sphagnum moss. Why the higher nitrogen for bark mix? Over time bark will break down, and in the process it uses up lots of nitrogen—resulting in less available for the plant to absorb. Therefore, using a fertilizer that helps supplement the nitrogen lost throughout the bark breakdown process will help keep the orchid happy. 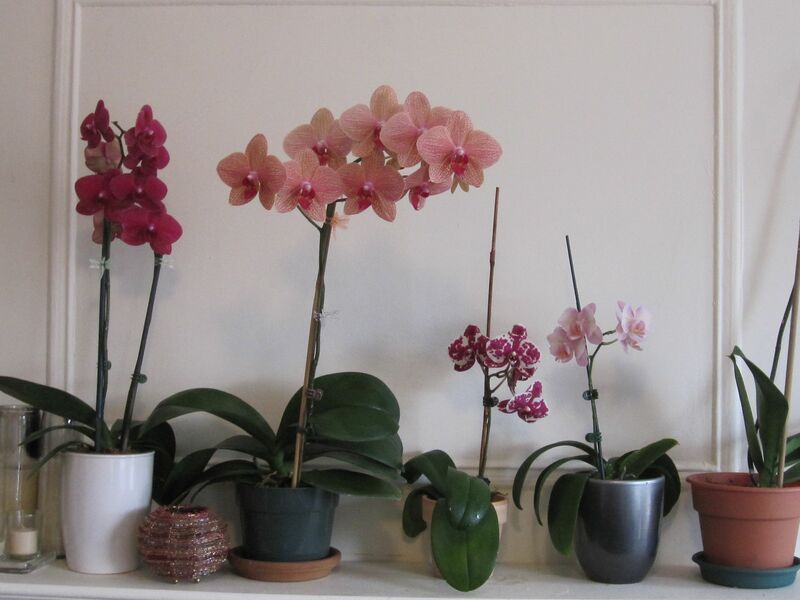 Orchid care needs do change with the seasons, and different types of orchid have different fertilizing needs. Those are more advanced discussions that I won’t even try to address in this post—I’m sticking to basic Phal fertilizing here. Once per month—feed orchid with full strength fertilizer (follow the directions for mixing fertilizer exactly the way it’s written on the package). “Weakly, weekly”—feed orchid with a weaker fertilizer mix than what’s recommended on the package. One-quarter strength is a good rule to follow. Thank you for patiently waiting for actual instructions on how to fertilize a Phalaenopsis orchid. 🙂 Before you get started you’ll want to grab a clean gallon container—all the fertilizer instructions I’ve seen say to mix a particular amount with one gallon of water. 1. Mix orchid fertilizer with warm water. If you’re fertilizing monthly, mix it full strength. If you’re fertilizing weakly, weekly, mix it at one quarter strength of what’s listed on the label (e.g., if the instructions say to use one teaspoon of fertilizer per gallon of water, only mix one quarter teaspoon with one gallon of water). 2. Before you apply the fertilizer, water your orchid THOROUGHLY. Fertilizer can burn and damage dry roots, so make sure they’re wet before you feed the plant. 3. Pour the fertilizer mixture into the pot and let drain as per usual. That’s it! Just make sure not to overfertilize your orchid. Feeding too often or using too strong of a fertilizer mixture can stunt an orchid’s growth. • Grow More: this brand offers a number of different fertilizer ratios. As of this writing I currently use three of their formulations on my various types of orchids. • Dyna-Gro Orchid Pro: Another recommendation from the smart folks at orchidboard.com that I have yet to try. Many years into growing orchids as a hobby, I’m still learning how to care for them. My own orchid collection is doing okay but there are definitely things I could be doing better (for starters, they need brighter light!). If you have any advice for newbies about orchid fertilizing, I’d love to hear it in the comments. *Nitrogen can either be derived from urea, ammonia, or nitrates. In natural settings, nitrogen derived from urea is not readily available to orchids, so look for a “urea free” fertilizer. ** I’m solely listing these brands because I’ve either used them or have read that they are good for orchids. I have never received any products from any of these brands. Just want to be clear that I’m not shilling for anyone aside from the Amazon affiliate links where you can purchase these products.